The reconstruction drawing depicts the village of Tulsk, Co. Roscommon, as it might have appeared towards the end of the 15th century, at an arbitrary date of c. 1480 (Figures 1 and 2). The reconstruction is based on the results of various archeological studies1,2, both published or continuing and as yet unpublished, and on consultations with the archaeologists concerned with the studies. These have investigated and thrown some light on three archaeological sites, the remains of a Dominican friary in the village and known locally as Tulsk Abbey, and two raised circular or sub-circular structures (probably early medieval ringforts) that have some loose masonry associated with them. 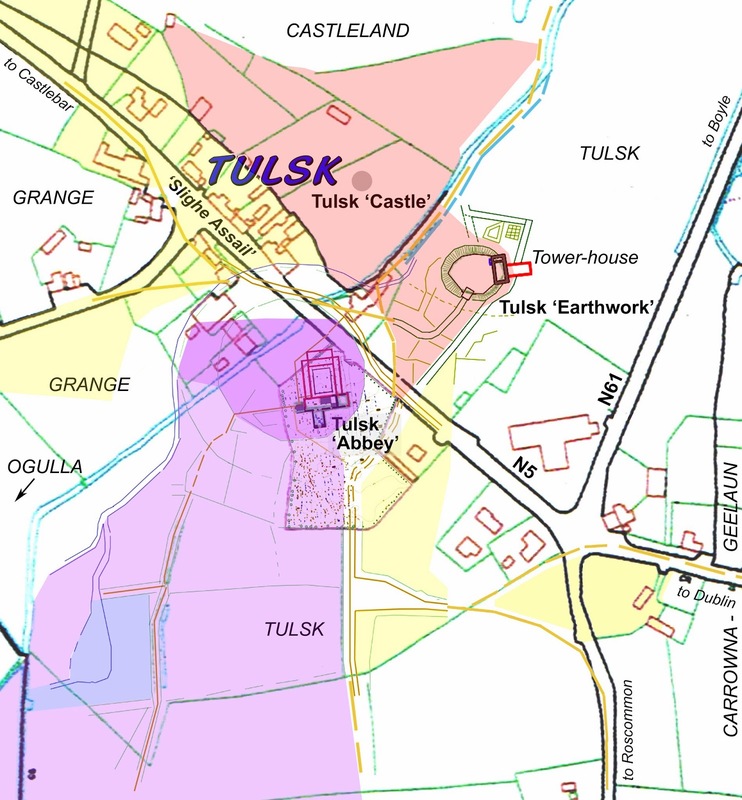 These extend into a relict landscape associated spatially with the friary and the larger of the earthworks, which is referred to as the Tulsk Earthwork on a local map of heritage sites (Figure 3). The Dominican friary, probably a priory rather than an abbey, is situated just south side of the (N5) Dublin-Castlebar road between the centre of the village and the major crossroads of the N5 and the Roscommon-Boyle road (N61). The friary was founded in the 1440s and a large south transept was added to the nave of the church, probably around the very end of the 15th century3. A simple tower house was constructed over the chancel of the church following its dissolution in the mid-16th century, possibly associated with a bawn (as suggested by a dashed line on the 1837 O.S. map, labelled ‘Site of Castle’: see Figure 8). At some stage after dissolution of the friary (or perhaps over a prolonged period) the cloister ranges were entirely demolished, though a limited trace of their substructure has shown up in geophysical survey. A relict landscape of earthworks has been identified south of the friary that includes evidence of extensive banks and ditches as well as the former trace of the Ogulla River and certain associated features. The larger of the ringforts in the village (the Tulsk Earthwork), which defines a sub-circular ellipse with an east-west diameter of 36m and a north-south diameter of 27m, is situated just east of the Ogulla River on the north side of the Dublin-Castlebar (N5) road across from the friary remains in the village graveyard. The Discovery Programme has excavated this site over successive recent years. Unexpectedly, these excavations revealed the basement level of a large tower-house of 15th century date – perhaps the O’Conor Roe castle recorded in 14063, which used the modified ringfort as its bawn. The tower-house was subsequently remodelled, possibly after prior demolition, and extended during the late medieval (16th-mid 17th centuries) English reconquest of Connacht. The tower-house itself appears to have had a multiphase development during the course of the 15th century. Once again, there is an extensive relict landscape of banks, ditches and other features associated with this site. Across the Ogulla River from this site is a smaller circular earthwork associated with some loose stonework that has been digitally surveyed but has not been excavated and which is known locally as ‘Tulsk Castle’. It is situated in Castleland townland and so, even if it was never the site of a castle per se, it is likely to have been the site of structures associated with the tower-house in some way. The reconstruction drawing is set late in the second half of the 15th century to illustrate the tower-house on the excavated ringfort when fully developed and prior to the late medieval remodelling, and the Dominican priory before the south transept or the later tower-house over the church chancel were added to it. The following explanation begins with the main archaeological sites: the Dominican friary and its associated relict landscape, the recently excavated tower-house and ringfort complex and the relict landscape associated with it, including the unexcavated ‘castle’ in Castleland townland. These are followed by an explanation for the representation of the medieval village of Tulsk. To make the reconstruction, a draft plan of all the geographical and archaeological elements was drafted (Figure 3), from which a virtual wire-frame model was generated using AutoCAD software. The line-work was then drawn in black ink on plastic tracing film. Colour was added using Adobe PhotoShop software. Only the ruined church of the Dominican friary in Tulsk survives to this day. In the reconstruction a very simple cloister complex is depicted on the north side of the friary church (Figure 4). The cloister complex is elongated north-south to reflect geophysical evidence for the northwest corner of the complex falling just outside the modern cemetery limits. Despite one opinion to the contrary, it is depicted as a set of two-storey structures modelled on other Irish examples in the northwest of the country, particularly those of Dominican affiliation and built in the mid-15th century – of which there are relatively few with substantial remains. A provisional digital reconstruction of Roscommon Abbey being constructed by the Discovery Programme staff is instructive in this case. It was assumed initially that the cloister ranges there too were single storey buildings, based on roof-creases for the east and west ranges that survive on the church wall and on the roof-crease for the cloister walk against the church between them. Looking at the surviving remains of the Roscommon Abbey, there is clearly a gap between the level of the lower terminations of the two roof-creases and the level of the cloister walk that is sufficient for a row of dormitory windows in between. This suggests that the friars’ dormitory probably formed a second storey, perhaps extending up into the roof space, with windows set low in its walls. Also, again despite one contrary opinion, the roofs follow the model most commonly found in Irish friaries in which each of the cloister ranges is gabled separately at each end as if it were a free-standing structure (some early examples, however, do follow the pattern of the larger Cistercian and Augustinian monasteries in which the roofs of the cloister ranges are generally perceived to have merged together). The one surviving window opening in the south wall of the friary church is interpreted as a two-light ogee-headed window in the reconstruction. A second, similar window is depicted where the arcade into the later south transept exists today. The east window of the church is based on contemporary analogues in the region. short segments of what appear perhaps to be two very incomplete, apparently concentrically arranged circular banks south and west of the friary that might represent a much earlier enclosed ecclesiastical site or perhaps an even older multivallate ringfort erected at this important cross-roads of ancient route-ways, or both in succession (referred to as the ‘early enclosure’ hereafter). In all cases the linear landscape features are assumed to be embankments (Figure 1), based on the survey published by O’Conor et al.1 and discussion of the same in the Discovery Programme Report 73 reproduction, and inspection of aerial photographs and newer geophysical survey images provided by The Discovery Programme and discussions about these with archaeologists on the ground and in the office. The western north-south feature appears to represent a discontinuous pair of embankments with a ‘ditch’ between them where they are paired, and with a path or track-way running along their east side. The river is shown following the meandering millrace identified by O’Conor et al.1. A mill was suggested for the area by those authors based on an interpretation of the original river course as a mill-race1, though it seems more likely that this was the original course of the Ogulla River before it was straightened. After some research and consideration of the mapped earthworks, two straight east-west orientated banks, connected at their eastern ends by a now incomplete north-south bank ( overprinted by the western pair of north-south banks) were interpreted to define a rectangular fish and, or millpond fed and drained by the original Ogulla River channel along its eastern margin. The core of the southernmost loop in the river as interpreted by O’Conor et al.1 has been retained in this interpretation as a small island that separates the main pond from a short millrace over which a horizontal watermill is depicted at its northern end (modelled on that excavated by Neil Jackman at Kilbegly in the south Co. Roscommon4). A managed overflow is also depicted at the northwest corner of the main pond (again based on the Kilbegly site). While this is pure speculation, there most probably were a mill, a millpond and one or more fishponds associated with the friary somewhere along the Ogulla River, and these are likely to have been sited close to where they are depicted in the reconstruction. The more widely-spaced embankments running north-south from the east side of the ‘early enclosure’ are interpreted as a north-south roadway, along the lines suggested by Discovery programme archaeologist Brian Shanahan in the field. In the reconstruction, this road is shown dividing when it comes to the friary inner precinct, one branch swinging eastwards in an arc around the inner precinct until it crosses the Ogulla river into Tulsk village, and the other continuing north to pass the O’Conor Roe tower-house (see below). The junction of the north-south embankments and the east-west orientated embankments is interpreted in the reconstruction as a ‘T’-road junction, perhaps representing the meeting of the medieval Dublin road (N5), part of the ancient Slighe Assail5, with the medieval Roscommon-Boyle road (N61). The banks defining the east-west part of this junction and the east side of the north-south road are interpreted as parts of two small farmstead enclosures on either side of the Dublin road, part of an outlying element of the main Tulsk village settlement. The embankment on the east side of the north-south road is interpreted as a boundary associated with the friary lands (see below). Looking at the O.S. map of the region, the sinuous nature of the Roscommon road not far south of the Tulsk crossroads suggests a more ancient character than the straight famine-relief road at the crossroads. On that basis, that part of the road has been retained in the extreme foreground of the reconstruction (as well as the archaeologically-defined, embanked road), but curving into the Dublin road just before the ‘T’-junction. The importance of Tulsk as an ancient crossroads and, by this time, a major O’Conor residential centre, suggests that many roads would have converged here. Between the two north-south embankment features, there are several more-or-less east-west embankments, and (from the latest Discovery Programme Geophysics results) some minor north-south features between them. These are interpreted as defining medieval field boundaries. The reconstruction takes the partial inner ring of concentric embankments defining the ‘early enclosure’ around the friary – perhaps part of an early medieval ecclesiastical enclosure – to define part of an inner precinct boundary around the friary. The remnant embankment is depicted surmounted by a timber fence or palisade, the gaps filled by straighter stretches of palisade (Figure 4). This is depicted as plain timberwork on the inside, but whitewashed on its exterior face (see below). An orchard-cemetery on the east side of the friary is shown fenced off within the inner precinct, at the west end of the church. The bulk of the inner precinct enclosure is occupied by cultivated ground, on which stubble waste is being burned, and an area of market gardening north of the cloister ranges. The gates into the precinct to east, south, west (by the river) and north are shown open to reflect the inferred open invitation of the preaching Dominican friars, also the parish priests, towards the local community. Up towards the southwest boundary of the ‘early enclosure’, a number of appropriately sized, more-or-less rectangular earthwork features have been interpreted as the sites of buildings associated with the friary. More specifically, these are imagined as: (nearest the friary, within the inner precinct) a guesthouse and a small stable; and (outside the inner precinct) a small house (with smoke) and outhouse, and two barn structures. All of these are placed in their own embanked enclosures. Finally, a finite outer precinct is defined in relation to the friary, which encloses the fields and farm buildings described above. Taking the squared-off pond as a model, I have closed this outer precinct with an arbitrarily-placed east-west embankment sited south of the village in today’s more intensively farmed country, and put a palisade or fence on this embankment too. Following discussion with Rory Sherlock, an archaeologist involved in the 2009 excavation of the larger ringfort and tower-house complex (the Tulsk Earthwork), a tentative staged plan of the excavated tower-house was drawn up as an aide to an interpretation of the evidence. Because only the lowest (basement) level of the tower-house survives, its reconstruction has been kept as simple as possible based on contemporary analogues from the wider region (including examples from northwest Co. Galway, County Sligo and east Co. Mayo). Of the limited excavated evidence (confined to the lowest level of the tower-house), the arched garderobe chute is shown in the well-preserved base batter of the tower, which has rounded corners (Figure 6). A chimney and a single turret capping a putative stairs are depicted on the tower roof. Following Rory Sherlock’s advice, the tower is crowned with stepped battlements in the Irish style, and rendered and whitewashed as was customary at the time (this last interpretation has been extended to apply also to the friary buildings). The edge of the older ringfort is depicted surmounted by a timber palisade to define a contemporary bawn. It is shown rendered and whitewashed on its exterior face to give it the appearance of a more formidable stone wall from the outside, with the timbers cut to define simple crenellations protecting a plank wall-walk. 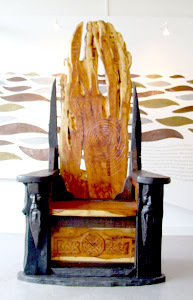 This was common practice on medieval timber castles6 and its depiction here is judged to be sound because this was a major O’Conor stronghold and knowledge of and the adoption of wider West European military building practice is evident in the construction of the tower-house itself. The structures within the tower-house bawn are based on inspection of the geophysical images of the earthwork. Once again, geophysical point-features were used to infer post-holes and these could be readily interpreted to define number of inter-connected, rectangular structures of different sizes aligned approximately southwest-northeast. These have been interpreted as timber-framed, thatched structures comprising an outer (soldiers’) hall, a kitchen, storerooms or chambers, and covered porches and walkways connecting them. Note, however, that even if the geophysical features are indeed post-holes – and they may represent nothing of the sort, it is quite possible that the structures they represent are late or post-medieval in date. The only wholly inferred structure in this part of the reconstruction is a covered timber stairway on the outer edge of the inner ditch (cut across the ringfort in front of the tower-house, but not really visible in the drawing), which assumes a typical second storey entrance into the tower-house. Based on a comment about evidence of loose masonry at this point and a rectangular pattern of point-features on the geophysical images of the site, a low rectangular stone gatehouse is inferred in the south face of the bawn, though with a south-westerly alignment. The presence of a stone tower-house suggests the likelihood that this was indeed stone-built – indeed, it could suggest that the bawn itself was stone walled and the face of ringwork beneath the bawn wall revetted in stone. If there were a stone gatehouse, the stepped battlements on the tower-house suggest that the gatehouse would have been similarly crowned. Note, however, that the gatehouse could still have been of timber construction and finished in the same way as the bawn palisade. 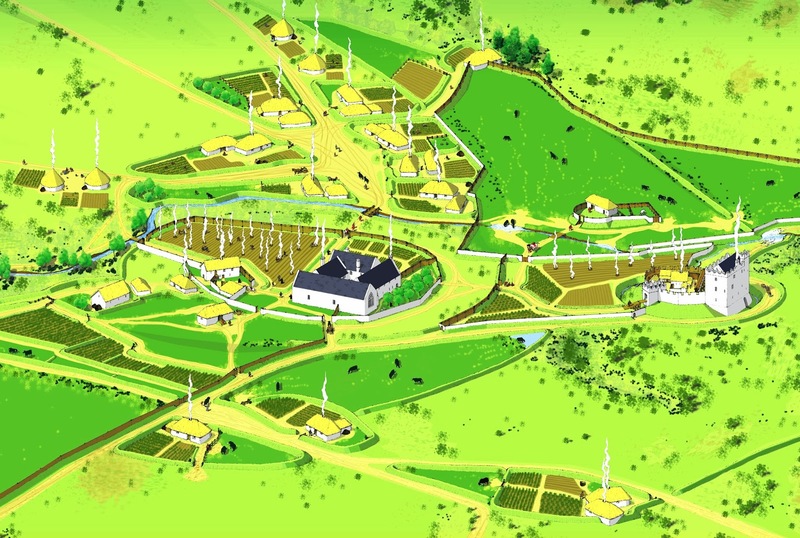 The reconstruction interprets geophysical images of a pair of parallel linear features curving from the ringwork gatehouse towards the friary to represent a road or track, and a number of shorter, subsidiary linear features (Figure 7) to represent small enclosures or fields on either side of it (Figure 3). More conjecturally, this area is depicted as enclosed up to an inferred remnant of the outer embankment of the ‘early enclosure’ by a fence or palisade, often on top of embankments. This area is taken to represent cultivated land directly related to upkeep of the O’Conor retinue based in the castle (Figure 5). Following much current archaeological thought, the modern townland boundaries are taken to represent much older territorial boundaries and, as such, several of these are depicted trailing across the reconstruction as embankments. Consequently the Castleland townland boundary that follows the Ogulla river beyond the tower-house and at the rear of the modern dwellings along the north side of the main road (N5) through the village is thus interpreted as having had significance also in the 15th century O’Conor landscape. It appears in the reconstruction as an embankment that follows the west bank of the river towards the northeast and runs along the northeastern edge of the medieval village and on along the townland boundary to the northwest, where for some distance a later, probably 17th or 18th century wall exists today. The boundary between the townlands of Tulsk and Carrownageelaun townlands is also shown as an embankment extending from the Dublin road (N5) into the woods along the eastern edge of the reconstruction (Figure 1). It should probably continue along the east side of the Roscommon road (N61) where it runs to the southern edge of the drawing. 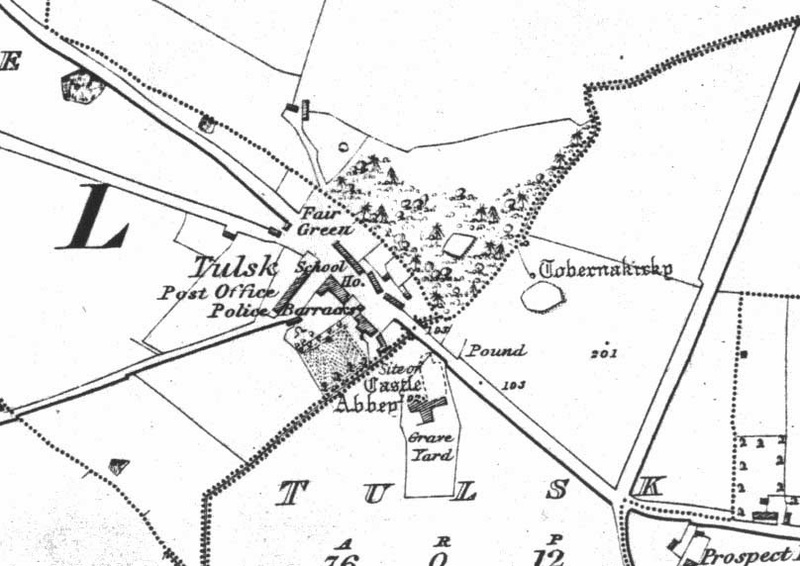 The boundary between the Tulsk and the Grange (and, further southwest, the Ogulla) townlands is defined south of the Dublin-Castlebar road (N5) by the Ogulla River. 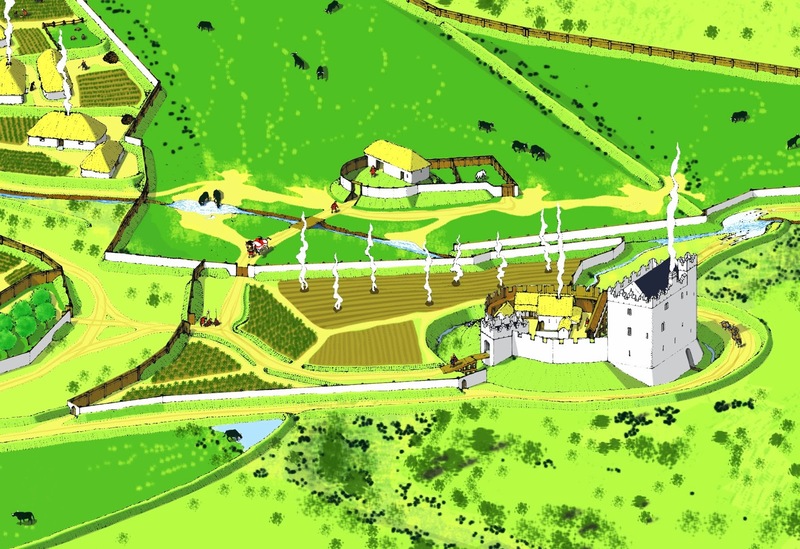 The Castleland earthwork (Tulsk Castle), however much reworked in the centuries since then, is inferred to have been a feature also of the 15th century landscape (Figure 6). Looking at a digital terrain model and aerial photographs of the earthwork provided by The Discovery Programme, it was clearly some sort of circular ringfort at one time, and the reconstruction infers that a break at the southern point of the perimeter bank marks the entrance. Using the digital terrain model, a thatched, timber-framed rectangular structure has been inferred on the built-up interior, where a stone building probably stood later, depicted as a stable or barn. A stone-faced embankment extending northeast and tangentially with the east side of the ringfort today is tentatively inferred to exist in 1480 too, and this together with several linear features evident just north of the ringfort on the digital terrain model are depicted enclosing a pair of yards that extend from a low palisade on the ringwork bank. While there is no evidence as yet for the age of any of the features on this site, and that the stone structures are almost certainly later than the 15th century, this interpretation is probably not unreasonable. I have extended this interpretation to create a context for this otherwise isolated stable or barn by enclosing the area in the angle of the townland boundary along a somewhat irregular and therefore perhaps ancient boundary that appears on the 1837 O.S. map (Figure 8), and enclosed it in an embankment topped with a low palisade or fence as an area of pasture serving the needs of the O’Conor retinue in the castle. Another question comes to mind at this point: are we seeing an ancient landscape in the cluster of sub-circular earthworks preserved and much-reused here, a satellite to the major sites of nearby Rathcroghan? A landscape defined by: a major multivallate ringfort, later an early medieval ecclesiastical enclosure and then the site of the friary; a second sizeable ringfort, later adapted as a bawn for a tower-house, perhaps with major avenues running north and south from it (see below); another still smaller ringfort across the river in Castleland townland, also reused in more historical periods; and at least one ringfort, smaller still, visible on aerial photographs half a kilometre west of the village and about 200 metres southeast of the N5 (and included towards the top-left of the reconstruction drawing as a derelict structure). In the reconstruction, an interpretation has been made of the possible medieval road pattern east of Tulsk village, one that predated the straight Roscommon-Boyle famine-relief road (N61) that runs from a short distance south of the Tulsk cross-roads to higher ground some 7-8 kilometres north of the cross-roads, at either end of which it resumes a more sinuous, probably more ancient course. It was deemed necessary to deviate from the present route because of the obvious need for drainage in that area. One possibility is that the road might have crossed the river into the village and then branched off the (N5) Dublin-Castlebar road west of the village, perhaps using the country road that takes an irregular northward route half a kilometre west of the village centre. This route would have avoided the need to ford the many streams that spring just east of it. 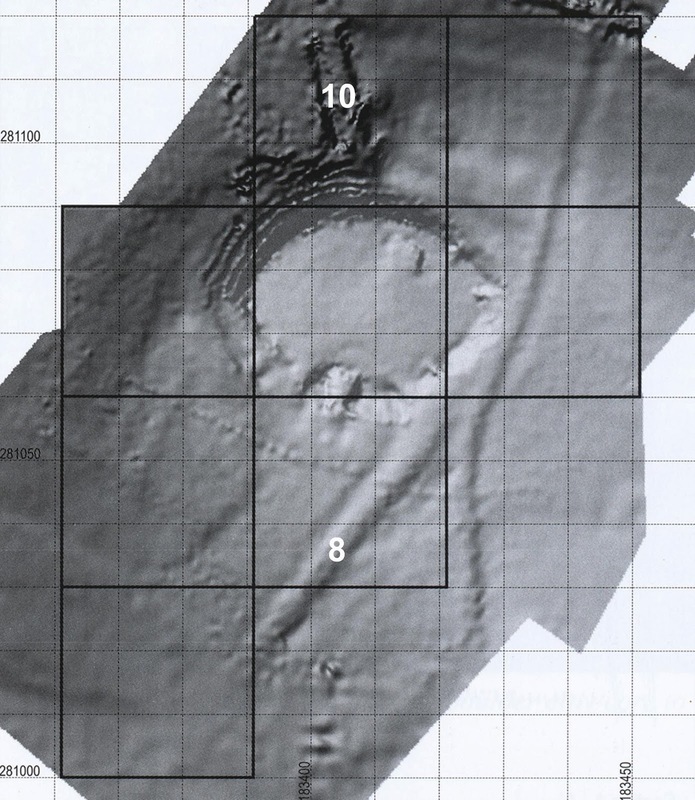 However, looking at The Discovery Programme topographical and geophysical survey results7, there is the suggestion of a 10-metre wide embanked ‘avenue’ that runs northwest to merge with the outer ditch of the tower-house (Figure 7, feature 87) and the similar feature north of the ringfort (Figure 7, feature 107). This may represent an ancient route-way, either interrupted by the building of the ringfort or alternatively contemporary with the ringfort and leading into it from south and north. The southern segment of this avenue (feature 8) can be traced linearly into the embanked road interpreted to skirt the eastern edge of the ‘early enclosure’. The reconstruction, therefore, extends these two features into each other as the possible medieval precursor of the subsequently straightened N61. Continuing northwards, the inferred road is interpreted to skirt the eastern side of the castle ditch (protected from the low-lying, poorly-drained ground by a low embankment) before rejoining the ancient route-way (feature 10), then fording the river and continuing along its west bank. This interpretation is highly speculative, but there is enough circumstantial evidence on the ground to make it a real possibility. 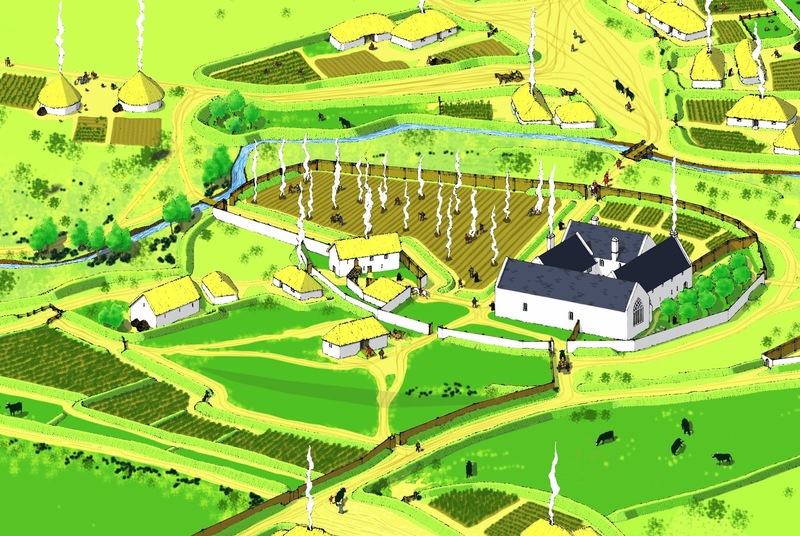 The reconstructed village of Tulsk (Figure 9), which is necessarily entirely speculative, is based on work published by archaeologist Kieran O’Conor8 and discussed with him in more detail in relation to this particular reconstruction, and on recent research on Gaelic medieval rural landscapes in an adjacent area of Co. Roscommon by, for example, McNeary and Shanahan9 and on comparable marginal parts of England in Cornwall10. Many roads come together in the reconstructed medieval village of Tulsk. One is a roadway shown on the 1837 O.S. map (Figure 8) and later as a laneway on the 1913 O.S. map that forms an acute angle on the south side of (N5) Dublin-Castlebar road just west of the Ogulla Bridge road, shown with more-or-less equal status to the other roads passing through the village. Thus, moving clockwise around the village, depicted are: the market place narrowing to a road over a small timber bridge crossing the Ogulla river to the southeast before continuing into the friary and on to the Dublin road (N5) beyond; the road that goes to the graveyard and holy well near Ogulla Bridge; the now-vanished roadway or laneway mentioned at the start of the paragraph; and the road to Castlebar (N5). Omitted is the road that turns off the Dublin Castlebar road at the west end of the modern village since it is not to present on the 1913 and earlier editions of the O.S. map. As interpreted in the reconstruction, the main part of the medieval village of Tulsk is limited to seven principal homesteads, with another three forming the outlying element southeast of the friary. All of these are set in small, irregular embanked enclosures that compare with those identified close by in the local landscape4. In all cases a thatched house (with smoke rising from the roof) and, attached or separate, one or more thatched outbuildings are depicted – very much along the lines of Herring’s reconstructions of similar settlements in Cornwall10. The thatched, round-cornered style of the buildings is based on recent archaeological excavations8 and Bartlett’s images of a century or so after the date of this reconstruction. The outlying sub-settlement southeast of the friary is shown in two cases with just one house, each with a small extension, and in once case with just two houses (perhaps for an extended family). The remainder of each house enclosure is shown divided between various forms of subsistence farming: for vegetables, pulses, occasionally fruit trees and livestock such as cattle, sheep and goats. I have kept the road at the centre of the village as the broad sub-triangular space, giving it an inferred greater antiquity as a market space corresponding more-or-less to the (later) ‘Fair Green’ indicated on the 1837 O.S. map (Figure 8). Also shown in the reconstruction are five ‘creats’ – thatched round-houses made of wattle and daub, continuing a Gaelic Irish building tradition that dates back to the Bronze Age and was still practiced at the time of Bartlett’s c. 1600 survey8. They are shown on the outskirts of the village along the road to Castlebar (N5) and the road to the holy well near Ogulla Bridge. Their location is intended to suggest – perhaps naively – that they are the homes of poorer folk, being somewhat anachronistic. They are shown unenclosed, with the open roadside verges simply ploughed up to provide vegetable gardens for a subsistence existence. Beside the creats along the road to the holy well, the peasant occupiers are shown selling food and other goods to pilgrims heading towards the holy well. The reconstruction is peopled throughout. People are walking towards or away from the village on the Dublin road, the Roscommon road, the Boyle road (with a train of mules) and on the lane south of the Castlebar road. Another person is driving a cart along the road to Castlebar. 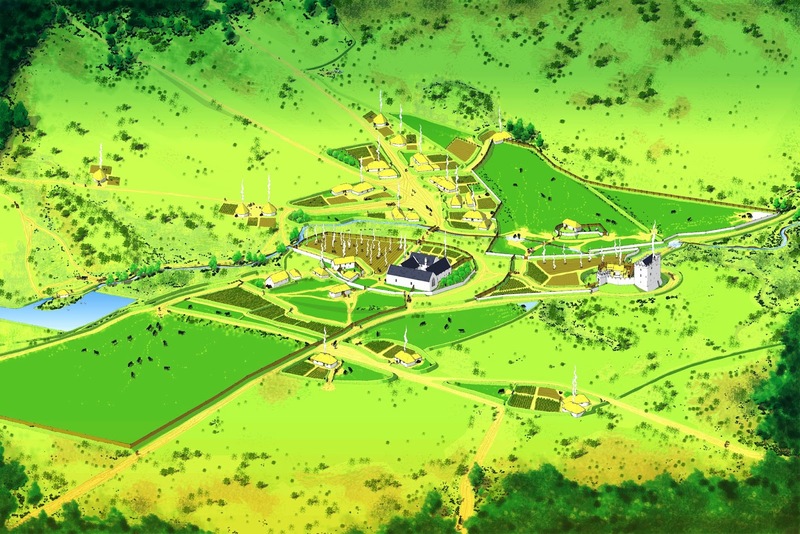 Several people are meeting or passing through the village itself, but many more – men, women and children – are working the plots associated with their dwellings. Others are travelling, on foot or on wagons, laden to and empty from the mill beside the millpond. Several pilgrims are making their way out of the village towards the holy well, some detained at the peasant stalls beside the creats. Many village men are working in the friary inner precinct, where stubble is being raked into heaps and burnt under the supervision of a Dominican friar (Figure 4). Perhaps these same people spent the early morning doing the same on the large field between the tower-house and bawn and the Ogulla River, where the fires have been left to burn out unsupervised now. A guest is walking towards and greeting the Dominican Prior at the west end of the church while his horse is taken by a servant to the stables associated with the guesthouse, where the Dominican guest-master is also visible. Two older friars walk with the aid of sticks, one toward the north entrance of the precinct (where the mounted man is entering) and the other in the cemetery-orchard east of the friary church. Other friary servants are working on the priory farm, at one of the two barns and herding typical black medieval cattle into a large field at the southern end of the friary’s outer precinct. In the outer enclosure of the tower-house castle, two people of rank (or one with his personal servant, the other red-headed – perhaps an O’Conor prince) are walking down the ramp from the bridge into the bawn while a servant is bringing their horses from the stable in Castleland townland (Figure 6). Three cloaked castle soldiers are playing dice just inside the outer gate of the castle. They are dressed in a red livery, reflecting their master’s nickname – O’Conor Roe, as are the three soldiers who trail behind their mounted master between the bridge over the Ogulla River and the north gate into the friary’s inner precinct Figures 4 and 6). 2 The Discovery programme 2005. North Roscommon in the Later Medieval Period: An Introduction. Discovery Programme Reports 7, 85pp. 3 Brady, N., Connon, A., Corns, A., McNeary, R., Shanahan, B. and Shaw, R. 2005. A Survey of the Priory and Graveyard at Tulsk, Co. Roscommon. In: North Roscommon in the Later Medieval Period: An Introduction. Discovery Programme Reports 7, 40-58. 4 Jackman, N. 2009. 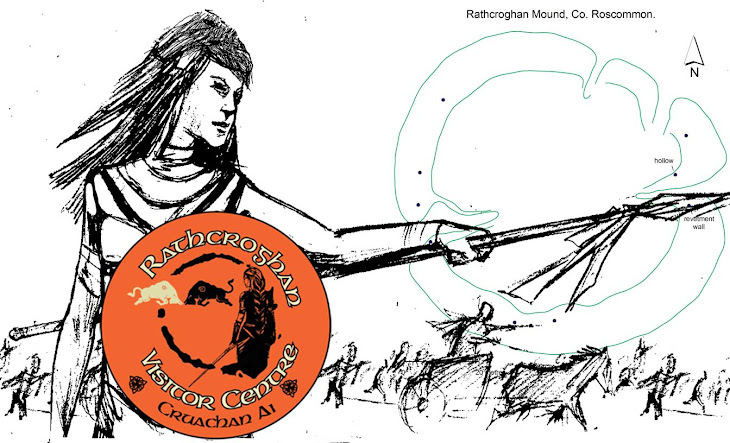 Early Medieval Food-Processing Technology at Kilbegly, Co. Roscommon: The Miller’s Tale. In: Dining and Dwelling: Proceedings of a Public Seminar on Archaeological Discoveries on National Road Schemes, August 2008. Archaeology and the National Roads Authority Monograph Series No. 6, NRA, Dublin, 9-18. 5 Doran, L. 2004. Medieval Communication Routes Through Longford and Roscommon and their associated Settlements. Proceedings of the Royal Irish Academy, 104C, 57-80. 6 Culleton, E. 1999. 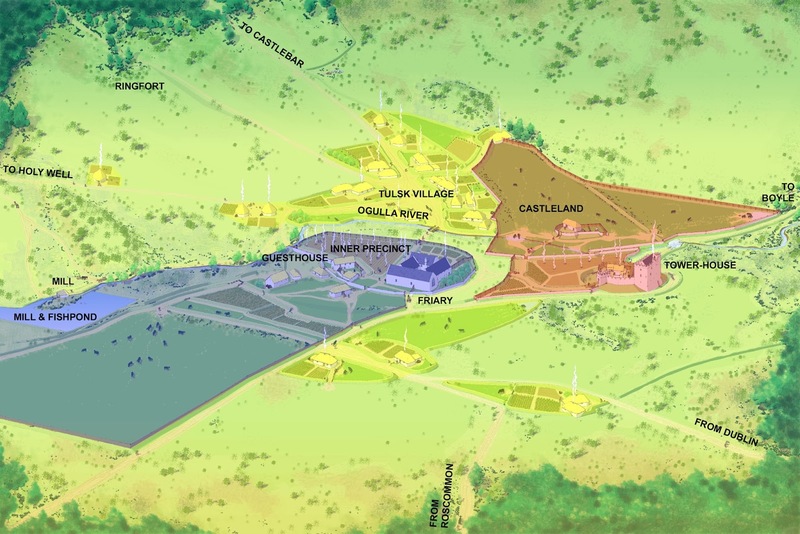 The origin and role of the Irish National Heritage Park. In: P.G. Stone and P.G. Planel (eds), The Constructed Past: Experimental archaeology, education and the public. One World Archaeology 36, London, 76-89; Higham, R. and Barker, P. 2004. Timber Castles. University of Exeter Press, Exeter, 390pp. 7 Brady, N. and Gibson, P. 2005. The Earthwork at Tulsk, Co. Roscommon: Topographical and Geophysical Survey and Preliminary Excavation. In: North Roscommon in the Later Medieval Period: An Introduction. Discovery Programme Reports 7, 59-75. 8 O’Conor, K.D. 1998. 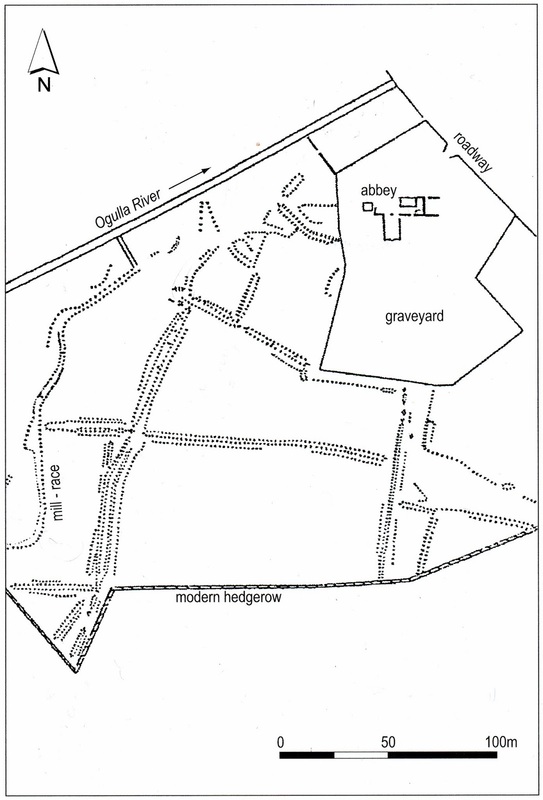 The Archaeology of Medieval Rural Settlement in Ireland. Discovery Programme Monograph No. 3, Royal Irish Academy, Dublin, 144pp. 9 McNeary, R. and Shanahan, B. 2008. Settlement and Enclosure in a Medieval Gaelic Lordship: a case study from the territory of the O’Conors of North Roscommon, Ireland. In: Landmarks and Socio-economic Systems: Constructing of Pre-industrial Landscapes and their Perception by Contemporary Societies. Presses Universitaires de Rennes, 187-197. 10 Herring, P. 2006. Cornish Strip Fields. In: S. Turner (ed. ), Medieval Devon and Cornwall: Shaping an Ancient Countryside, Windgather Press, Macclesfield, 44-77; Herring, P. 2006. Medieval Fields at Brown Willy, Bodmin Moor. In Medieval Devon and Cornwall: Shaping an Ancient Countryside, Windgather Press, Macclesfield, 78-103. The following must be thanked for their assistance during the course of the Tulsk reconstruction drawing project. Niall Brady and Brian Shanahan of The Discovery programme; and Kieran O’Conor and Rory Sherlock of the Department of Archaeology, National University of Ireland, Galway for their archaeological advice. The representation of their knowledge and ideas and any errors or misconceptions that found their way into the reconstruction are entirely the author’s responsibility. Thanks also to Lora O’Brien of the Cruachan Aí Heritage Centre, Tulsk, and Seamus Conway and his colleagues in the Tulsk Action Group, who generously provided the funding for the project.